I'm in the middle of planning dinner menus and shopping lists - and trying to figure out how it's all going to get done - for a week-long camp that is coming up very very soon. Thankfully I do have help, and it will get done - and we are going to feed a lot of hungry people! Sprinkle with onion soup mix; pour pepperoncini juice and broth into crock pot and add pepperoncinis. Shred beef with two forks and stir. Serve on bread, rolls, or buns with a slice of cheese. The original recipe called for just pouring a 16-oz. 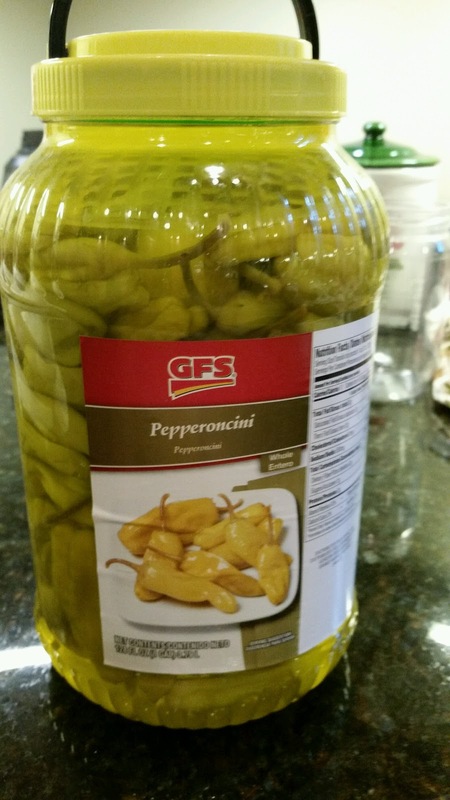 jar of pepperoncini over the roast - that's it, just a roast and a jar of pepperoncini. So I complicated it a bit by adding the onion soup mix and beef broth, but this recipe is still super simple. Also, I'm not sure how many peppers and how much juice is in a 16-oz. jar, because I buy them by the gallon ($6.99 at GFS!). So I just guessed. 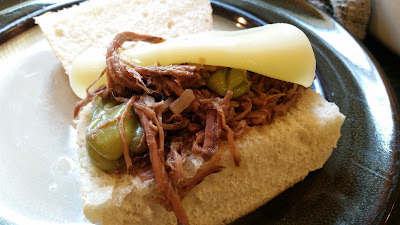 This ended up quite juicy, but that's OK because you want some of that oh-so-tasty broth along with your beef because it soaks into the bread and comes pretty close to absolute perfection. Messy perfection, but perfection nonetheless. Just be sure to have some napkins handy, and hold over your plate. For those worried that this might be a bit spicy, it really isn't. There's a nice tang to it, but it's really not spicy. Of course those who like a little spice will want one (or two) of the warm pepperoncinis on their sandwiches. 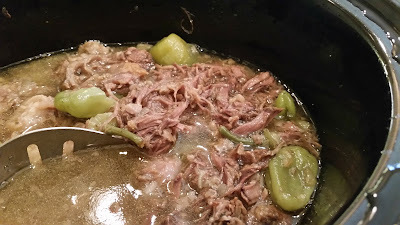 (it doesn't really add much heat, but the flavor is great) I would recommend removing the peppers before shredding the beef - which I did not do. Otherwise you will end up shredding some of the peppers too, and then it's really hard to serve up a sandwich without some pieces of pepperoncini in it. Also, you'll end up with random stems floating around that nobody wants to eat. We had a nice garden salad to go along with our sandwiches. Did I mention that I'm getting lettuce, lettuce, and more lettuce out of my garden? My husband skipped the salad and just had another sandwich. I had more salad - but then I couldn't help snitching a few pieces of this beef as I cleaned up the kitchen after dinner. So good! I'd definitely recommend this recipe. So much flavor with so little work - I think we have a winner.